Active sun showing hotspots of internal torus standing wave patterns. 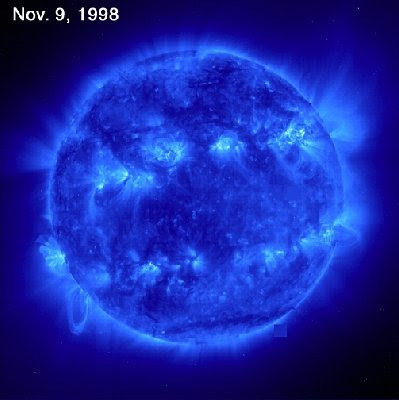 The number of hotspots(standing wave peaks)in the tori is frequency dependent, while the magnitude will vary with the solar cycle electrical activity levels, and will affect the appearance of the sun at higher levels. its various configurations. Depending on the number of virtual poles, i.e the number of standing wave hotspots in the tori created by the biconical antenna at the heart of all structures across all scales. 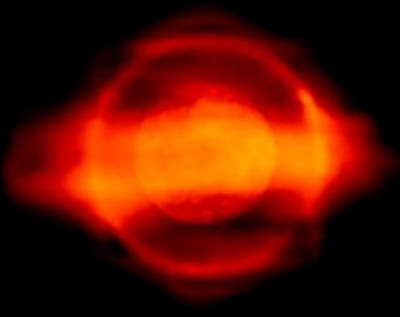 These patterns will be observed in images of objects in space, yet to be recorded. 4,8,12,16,24,32 are the most common number of rays or dots, due to resonance in the torus. Other pattern may arise due to harmonics as the power in the circuit changes. Remember also that all these devices are of a floating neutral nature, so changes in the background (local fluff) voltage vs the birkland current energy will result in a changing power dissipation and altered appearance. Thats how everything is to my detecting, it's all ONE, to scale. Hi JL, I only have a very limited understanding of the APM model, when I first looked at it and saw.. The Aether Physics Model predicts black holes are implosion events, which release the encapsulated dark matter back into the sea of dark matter. A black hole has a short life span and then it evaporates. ..I thought I'd give it a pass, for now anyway. It doesn't seem to deal with the origin or geometry of the proton, but perhaps I'm selling the model short? Dark matter in this case is angular momentum. Dave Thomson agrees that there are no black holes and no dark matter. The terms in that sentence are not representive of common usage in cosmology. GaryN wrote: its various configurations. Depending on the number of virtual poles, i.e the number of standing wave hotspots in the tori created by the biconical antenna at the heart of all structures across all scales. Funny, what you describe as antennae is what i observe as conical ejection or conical attraction. Usually a "multipolar" core is ejecting, on its way back the ejected it is changing "polarity" and falling back in a conical shape. 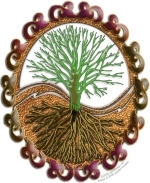 The twigs are the ejecting part, the roots are the attracting part. The multipolar core is located at the border between above-surface and below-surface. Might say this is the center of the tress soul. The mystic part is the spiritual part where the ejected changes polarity/orientation. We might imagine it like a ring on the height level of the core. Would look much like a the ring of Saturn. In the case of the tree this is the part where the leaves fall and turn back to soil. The ejected turns to attracted. In our blood circuit at the end of the vessels the blood changes its name and returns to the heart. Magnetic lines (although a field to be honest) leave at a pole and "change" orientation at the equator of the field. Thats why i often wonder why nobody mentions the "imaginary" ring that surrounds our planet (and anything else that exists). Where do protons come from? Google doesn't give me a whole lot of help with that question. Bosons split into two protons just after the big bang? But I don't believe in the Big Bang! What does a proton look like. Not much on the 'net there either, but there is one image. However, I think there may be a different structure. It means getting rid of the "Universe" though, and I think I have found the guy with the answer. I have had a brief correspondence with the author, but since I mentioned the EU, I have heard no more. The author may not agree with the EU model, but I like his idea. It fits in with the shape of what I think I have seen at the center of stars. We replace Universe with Tetrahedraverse, or Tverse, and the proton becomes the Tproton. ..Tetrahedraverse's "proton" is a closed, regular, non-nucleated icosahedron.. The concept of No-Thing, which I know we have discussed before, is also important, and is covered on the authors site. I'd be interested to hear other EUers opinions. He is using the Bucky Jitterbug, with the removeal of the innear one surrounded by twelve. I mentioned that a while ago. That atomic quantum jumps may be from the center, not the outer shell or valence electron, let alone the atomic nucleus and its ejections. Alpha particles have been strucuturely created with Zome. Infact I have built this with my Zome Tools and made a thread about it. Ah, the Non-thermal Universe. They come up with all kinds of ideas to try and explain the extreme energies. Magnetic fields of neutron stars are a favorite. All the energies are easily explained with the fully EM universe. So far, the Non-thermal Universe is still pretty much Terra Incognita, and while the sources and collective acceleration mechanisms for particles of TeV energies and beyond are subject of much speculation and theoretical work, the experimental identification of sources and of acceleration mechanisms is challenging. Before the advent of advanced instruments such as H.E.S.S., only few—and possible atypical—objects had been detected, and even less had been studied in any detail. The inner Van Allen radiation belt torus has its center at around 3 earth radii. This torus will be equal to the first resoant frequency of the earths fullwave biconical antenna. Wavelength to frequency conversion gives 7.83 Hz. Well within the range of the Schumann resonance primary frequency range. Coincidence? The earths antenna is a reciever and a transmitter. The Suns antenna transmits at multiple frequencies, so there will be many toriods surrounding the earths primary Van Allen torus. The torus is one of the primary building blocks of an EM Universe, as it can confine and accelerate particles within its self ampifying magnetic field. Based on my expanding awareness of the Phase Conjugate System and its fundamental harmonics, this relationship you have pointed out supports the fact that the sun, earth, solar system, galaxy, is a Phase Conjugate System. Well, not sure about that, but what an imagination! My first clue came when I wrote a short piece suggesting that the fundamental cause of relativity phenomena might be that all matter was comprised of photons alone. I submitted the piece to scientific journals that claimed to publish ideas outside the scientific mainstream. I found no takers, but what surprised me was the anger the piece evoked from the reviewers. The most profound and telling rejection came from Nature with the admonishment that "such ideas were dangerous", to the scientific community. These facts are presented not as teaching but as a reminder of things you already know or can discover very easily. Nature does not hide its construct. Nature screams out to us that it is a simple electromagnetic process. Nature is relentless. Nature is real. Nature is screaming, "the final irreducible constituent of all physical reality is the electromagnetic field. I have always said that we are just frozen light....APM says what the Photon model says, just the other way around, a photon is an electron expanding at the speed of light. I had the revelation in Electronic College that when a electron and a photon exchange, they exchange spin, angular momentum, which APM says is actually correct. How cool a imagination I have too. Uranus is an odd one. Explain this to me with a gravity only model. It looks like a well designed machine, with all the rings and moons looking mathematically spaced. How do the mooons remain in such precise, almost zero excentricity orbits? Being so close to each other, why don't they affect each other and become chaotic in their motion? Most of the outer moons have a retrograde orbit, so they are all captured? Although vibration is equal partner to charge in the universe, even the Thunderbolts site doesn't seem to want to include it in their 'serious' boards. Well, without vibration, the universe would be (dare I say it?) rather 'static'. Cymatics is relegated to NIAMI, though it is responsible for the orbits of planets and their moons. 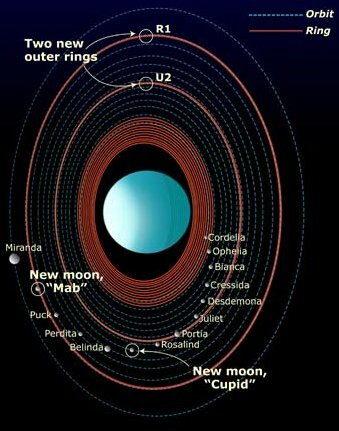 A medal to whoever can explain why Uranus and its moons and rings are laying sideways.